Many years after the World Wars, the infantry helmet has become a symbol of war. A descendant of bronze and iron helmets used by legionnaires, gladiators, knights, and other warriors of the past, the steel helmet is one of the few elements of a soldier's equipment that hasn't changed its initial function in our days, despite significant technological progress. The most memorable such helmet of the first half of the 20th century was the Stahlhelm (steel helmet). Its aggressive and predatory form is easily recognizeable: a combination of a cylindrical portion, protecting the head, a cone-shaped portion protecting the back, neck, and ears from shrapnel raining from above, and a protruding visor. The Wehrmacht soldier's visage with a stark shadow cast by the helmet's visor was a staple of propaganda. What is the history of this helmet? I report that out of 10 MK-2 (Matilda) tanks received by the regiment, only two were equipped with radios. An investigation discovered that the radios were "redistributed" at the 201st Tank Brigade prior to sending their tanks to a different unit. The 1st Tank Battalion of the 201st Tank Brigade was especially guilty of illegally taking parts from the tanks, as it was done at night without the tank commander present. I consider these disorderly and criminal actions of commanders who allowed the "parting out" of fully functional combat vehicles. I ask you to petition the Front commander to discover the culprit and return the radios for installation into our tanks. Chief of Staff, Guards Major Shuderman"
A large amount of guns and ammunition has been captured during offensive operations, which few generals and officers thought about using, despite complications with delivery of domestic ammunition. Firing from standstill at an angle of 0 degrees. Panther. Aiming was done using manual traverse. Panther and PzIII in a 30 deg arc. Aiming was done using manual traverse. Panther tank, PzIII tank, 3x3 meter target in a 40 deg arc. Aiming was done using manual traverse. Panther tank, PzIII tank, 3x3 meter target in a 40 deg arc. Aiming was done with electric traverse. Artillery in general is often left by the wayside in discussions of armoured tank-on-tank clashes, but the importance of artillery in warfare cannot be overstated. The history of German mechanized artillery is interesting in two ways. One is from the technical point of view, an exploration of evolution from howitzers rolled up on hastily cobbled together riveted boxes on tracks to specialized multi-purpose tracked chassis developed specifically for the role. The other is the quick reaction to a doctrinal need, the requirement to supply quickly moving tank and mechanized infantry units with artillery that did not have to rely on slow and vulnerable horses. 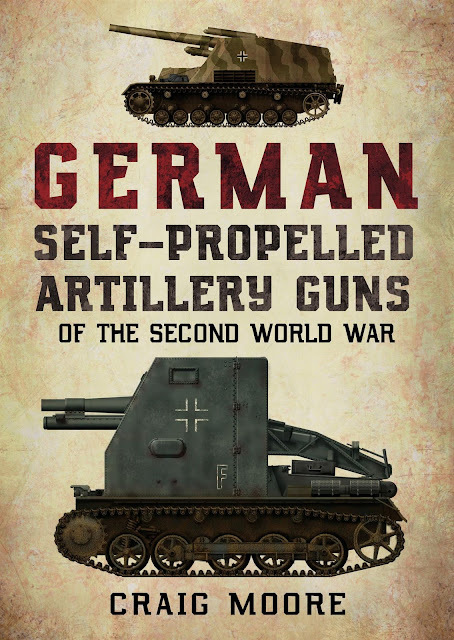 Craig Moore's book German Self-Propelled Artillery Guns of the Second World War offers a look at this fascinating and often overlooked facet of WWII armoured warfare. A boom of intelligence about the enemy's weapons came during the summer of 1943. Compared to captured German aircraft and tanks, an "automatic carbine" captured at Kholm, as it was called in the reports, didn't seem as impressive. However, the consequences of its capture for the Soviet small arms industry were not just significant, but, without a shadow of exaggeration, grandiose. As mentioned in telephone dispatches ##2539 and 2540 on December 12th, 1943, an unknown person wearing the uniform of a German officer successfully attempted to discover information on our positions and the units occupying them within the sector of the fusilier battalion. Some personnel freely reported information without asking for any documents, despite orders. The enemy agent was not apprehended. In carrying out the Committee of Defense decree #428 issued on November 19th, 1940, I present to you my thoughts on moving the T-34 to a torsion bar suspension. Factory #183 under-supplied the GABTU with 1086 friction clutches for the M-5 and M-17 engines in the following amounts: 327 in 1938, 267 in 1939, 492 in 1940. Due to these missing supplies and 1000 M-17 aircraft engines transferred to the GABTU from the GUVVS, GABTU warehouses and repair bases now hold 2500 engines (2000 M-17 and 500 M-5) which cannot be used to repair BT tanks or replenish spares stocks without friction clutches. The only factory producing friction clutches is factory #183, which aims to produce 200 M-5 clutches and 270 M-17 clutches, which satisfies the GABTU's requirements by 20%. I ask you to instruct the People's Commissariat of Medium Manufacturing to include production of 2500 friction clutches into factory #183's production program for 1941 to fully satisfy the GABTU's requirements. Marshal of the Soviet Union, G. Kulik." Russia, of all places, recently had to import a number of T-34-85 tanks from Laos, due to a shortage of functional ones to show off in parades and shows. Interestingly enough, when I was in England there appeared to be no shortage of this type of tank at all. In fact, there were probably more of them per capita than in Russia. Let's take a look. The idea of a specialized SPG for supporting tank and infantry units came to the Americans in the early 1930s. However, attempts to build such a vehicle ended up with nothing. As a result, the US Army began WWII without an SPG. The HMC T30, built on the M3 halftrack, entered trials in January of 1942. The SPG was launched into production in February of that year. Even though a large number of these halftracks was built, 500 units in all, the Americans saw it as only a temporary solution. Requirements for an SPG with a 75 mm howitzer on a tank chassis were still not met. A cast turret weighs 2035 kg. A rolled turret weighs 1885 kg. The 57 mm anti-tank gun installed on the Komsomolets tractor showed itself in battle as a fearsome weapon against all types and brands of enemy tanks. Positive and negative sides were discovered during use in combat. Accuracy and precision trials were performed using steel HE grenades. Aiming was done with the stock TSh-15 sight. Ambient temperature: +32 degrees C.
Firing from standstill at a vertical target initially. The total mass of the T-34 tank is limited to 26 tons. The approved armament of the T-34 tank is the 76 mm L-11 gun with the coaxial DT machinegun in the tank's turret, a second DT for the radio operator, and one submachinegun (PPD) in the turret to fire from hatches. Begin arming the T-34 tank with the F-34 gun starting with January 1st, 1941. Technical progress moves in giant leaps during large wars. This rule applied to nearly all types of weapons and armament during WWII, including tanks. Every year of war raised the bar of requirements, and even the newest fighting machines quickly became outdated. The heavy IS-1 tank was created as a response to the Tiger, but was obsolete by the time it entered production. The IS-2 that came to replace it had a much more powerful gun, but it too would need to be replaced soon. Today let us remember the tanks that were supposed to replace the IS-2 in 1944. Not a single one was ever built in metal, but work on these projects resulted in the creation of the IS-2 with straight upper front hull armour and the IS-3. One of the biggest issues with T-34 production was the use of new austenitic electrodes, which welders were not skilled at working with. A group of instructors from the NII-48 research institute had to be dispatched to teach them how to work this this new type of welding, which radically reduced the amount of defective armour components. Workers from the 3rd department of the NII-48 resolved a series of issues, which radically increased the quality of armour (austenitic electrodes, repair of armour, welding of thick armour, assistance to factories) by travelling to Podolsk factory and factory #183 to assist in mastering welding of armoured pats.